A Georgia bill would create a state commission to set and oversee journalism ethics. What do legislators fear would happen otherwise? Between 2005 and 2016, 40 journalists were killed reporting on environmental issues worldwide. Fewer journalists were killed reporting from Afghanistan during the US war. Leader of #Women2Drive Movement in Saudi Arabia says dissidents are never safe from authoritarian governments. In solidarity with the Boston Globe and hundreds of media outlets across the country, we at NPQ express our dismay at the dangerous slandering of the press coming from the White House and remind ourselves and others of the media’s essential role, even if not always fully realized, in building an engaged civil society and an active democracy. The Boston Globe has invited other news organizations to join them in expressing to their own communities in their own ways how important the free press is to democracy and to protest the constant attacks against it from this presidency. it’s a matter of growing concern that journalists appear to be being imprisoned in ever-higher numbers. 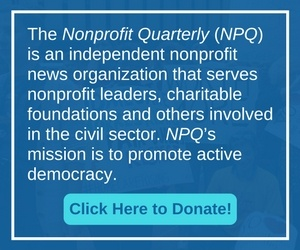 While the number of the groups varies among news sources, more than two dozen Pakistani nonprofits have been ordered to close under implementation of new rules governing international NGOs. If a protest does not get covered, did it occur? Political dissent is being stamped out in the west African nation of Togo, as much of the world sleeps.